Electric device whose two electrodes produce the spark necessary to ignite the air/gasoline mixture in the cylinder. Space between two electrodes, where the spark is created. Metal shank welded to the spark plug body and curving under the center electrode. Lower part of the spark plug that screws into the cylinder head. 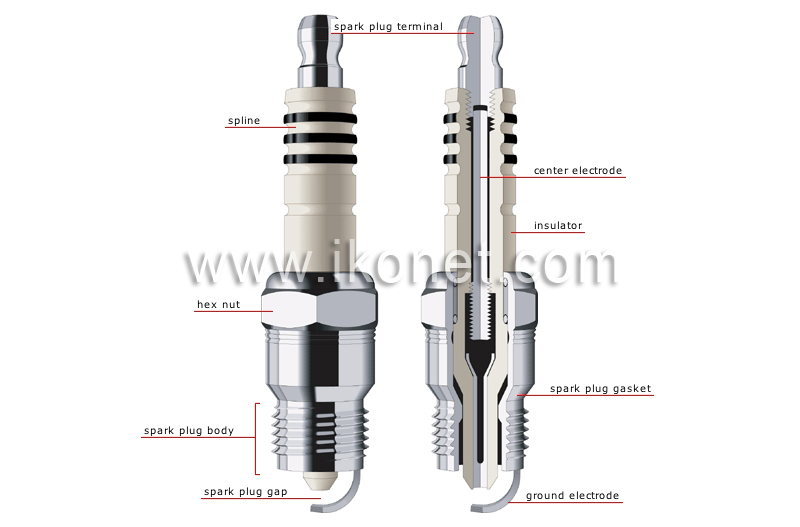 The ground electrode is part of the spark plug body, from which the end of the center electrode protrudes. Machined part providing the seal between the spark plug body and the cylinder head. Six-faced nut providing a grip on the spark plug to tighten it. Porcelain part, resistant to high temperatures, insulating the center electrode to prevent short circuits. Metal shank through which the electric current passes after being transmitted by the terminal. Rib that prevents the current from spreading outside the spark plug, thus avoiding short circuits. Top part of the spark plug that plugs into a cable connected to the distributor cap.